I have a great giveaway I wanted to share with all of you! Entering is really easy-Just like World of Judaica on Facebook, and sign up for their newsletter, and that's it! There will only be one winner, and the giveaway will end on December 12th - Just in time for Hanukkah! The Menorah being given away is absolutely stunning, and I could definitely understand if you just can't wait to see if you've won. 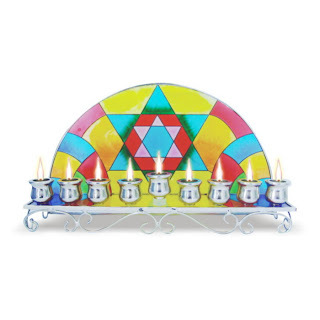 World of Judaica has a great selection of beautiful Menorahs so stop by and browse their selection. While your there check the rest of their great selection of items. They have things ranging from beautiful Dreidels, to an exquisite selection of Jewish Jewelry. See details on how you can enter, HERE. All opinions expressed are my own, and were not influenced in any way. I am being compensated for this post. Facebook is in no way involved. Just entered - thanks so much for letting me know! The only menorah I have is a silvery one I bought on sale ... it would be lovely to have a really nice one! Thank you, I have entered. Truly wonderful.